Again I was feeling shity at night. I tended to get fever again, so we needed to take some desiciones how to go on. Finally we changed our plans. I was really pissed. A never ending story. We thought about how to move on without the physical effort of cycling because still I didn´t feel ready for pedaling at all!I called my sri lankan soulmate Milton. I knew he would help us out for sure. It´s the same Milton who had visited us just yesterday with all his lovely family. He was ready immediately to pick us up. He rented a jeep in Sigiriya where he lives and came. (By the way, he owns an amazing guesthouse in Sigiriya, the “Paradise Inn” pretty close to the tourist attraction of Sigiriya – “the rock”. From his garden you have a wonderful view of the rock and in about 15min you can walk there.) 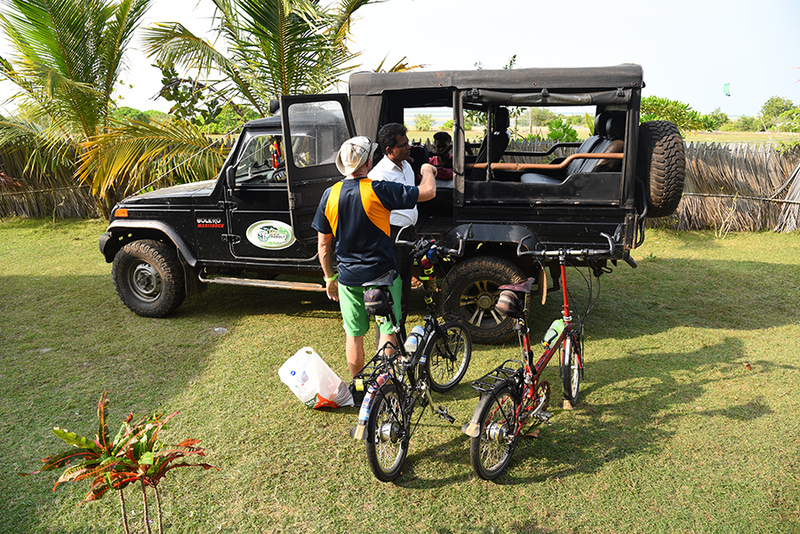 When I asked him if he could organize a car in which we could take the bikes, too his only comment was “don´t worry my friend” and after 4 hours he was standing in front of our bungalow with a Mahindra jeep! 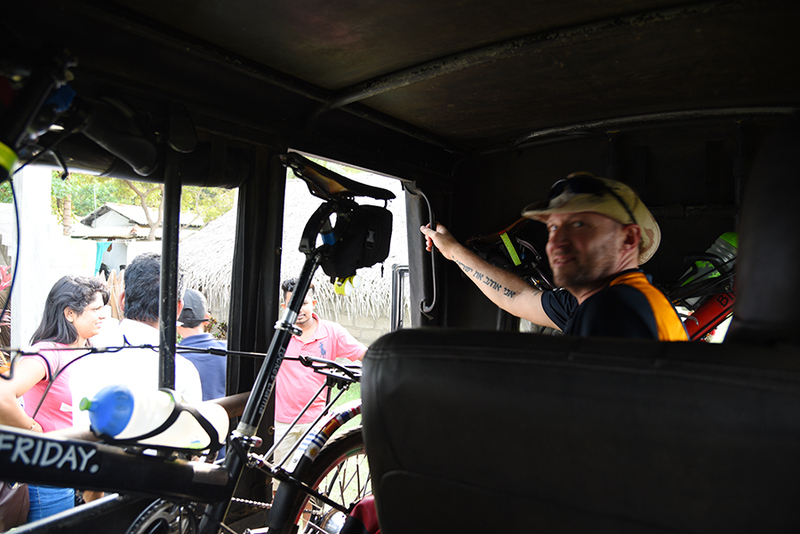 We put on all our luggage, the bikes and here we were – on our way to Sigiriya. Somehow I began to feel a little bit better. Maybe because I felt less pressure of finding urgently a solution to all this? Who knows. We had a small break and after the driver offered me to drive for a while if I wanted. He felt a little bit tired I guess. It was my first time driving on right hand and Harshina, one of my friend´s daughter, loved it, because for them, I was going real fast. In fact it was just some 90km/h, but we all had fun. We arrived at Sigiriya at 22:30. This was a long day. Milton´s wife was welcoming us with a tea and had already arranged an appointment for me at a doctor next day. They gave us their nicest bungalow with rock view! After a nice and hot shower I fell into bed. I´m sure I will sleep like a baby.